I know what it looks like. The beautiful pictures, the never-ending sunny days, the crystal clear sea and the food as fresh it looks. But Spain has its challenges, its quirks and in Mallorca - 2 languages to decipher. The humming noise near my head as I tried to sleep in the oppressive heat last week turned out to be a nest, a swarm rather, of flying ants. Apparently they live in the electric socket in the wall - so we sprayed the crap out of the them with some severe Spanish chemicals and vacated the room for 2 nights. After clearing up a city of ants and their flying queens we attempted to sleep in our room again. More Spanish chemicals were needed. The heat is what we dream of in grey and rainy climes. But it is insanely hot this time of year in Mallorca. P hasn't worn clothes for days, she asks whether anyone is coming to the house so she can decide whether to wear pants or not. The pool is a necessity. 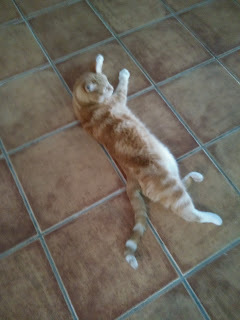 The cats spread out on the tiled floor hoping to get as much of their furry bodies on the cooler material as they can. They pant. They hide. They turn up their noses at the Spanish cat food and demand tuna fish. Their world has been turned upside down. The Internet comes and goes. It disappears if it's windy, or if it's cold or if a man knocks off a wire from the pole near our house. And we have to sort it in Spanish. And the driving is scary as hell. I can get to Campos where my friend lives, to Aldi the Supermarket and to the petrol station. I have to do the airport tomorrow. I'm nervous already - keep to the right, keep to the right, keep to the right.